Call 602-432-7663, Space is limited register early! 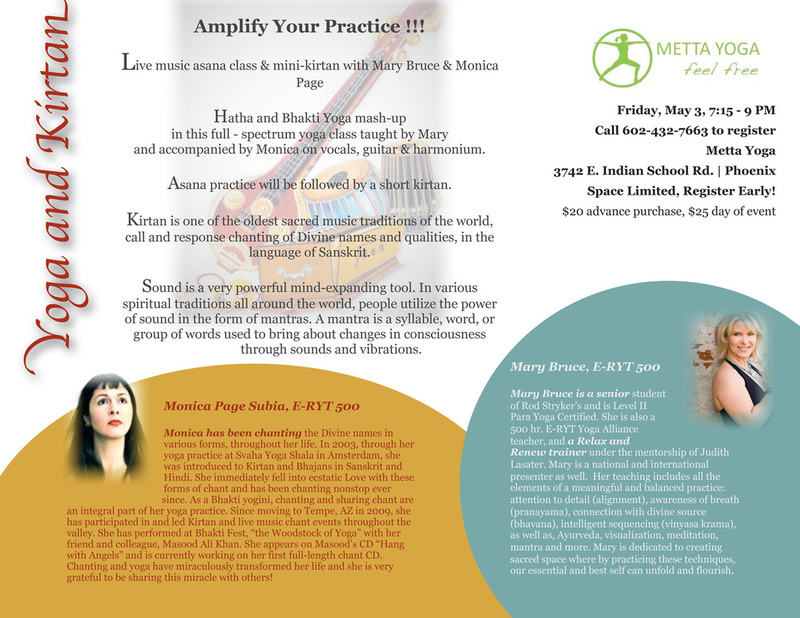 Live music asana class & mini-kirtan with Mary Bruce and Monica Page. Hatha and Bhakti Yoga mash-up in this full spectrum yoga class taught by Mary and accompanied by Monica on vocals, guitar and harmonium. Asana practice will be followed by a short kirtan. Kirtan is one of the oldest sacred music traditions of the world, call and response chanting of Divine names and qualities, in the language of Sanskrit. Sound is a very powerful mind-expanding tool. In various spiritual traditions all around the world, people utilize the power of sound in the form of mantras. A mantra is a syllable, word, or group of words used to bring about changes in consciousness through sounds and vibrations. In 2003, through her yoga practice at Svaha Yoga Shala in Amsterdam, she was introduced to Kirtan and Bhajans in Sanskrit and Hindi. She immediately fell into ecstatic Love with these forms of chant and has been chanting nonstop ever since. As a Bhakti yogini, chanting and sharing chant are an integral part of her yoga practice. Since moving to Tempe, AZ in 2009, she has participated in and led Kirtan and live music chant events throughout the valley. She has performed at Bhakti Fest, “the Woodstock of Yoga” with her friend and colleague, Masood Ali Khan. She appears on Masood’s CD “Hang with Angels” and is currently working on her first full-length chant CD. Chanting and yoga have miraculously transformed her life and she is very grateful to be sharing this miracle with others! Visit Monica's Web site for more information.